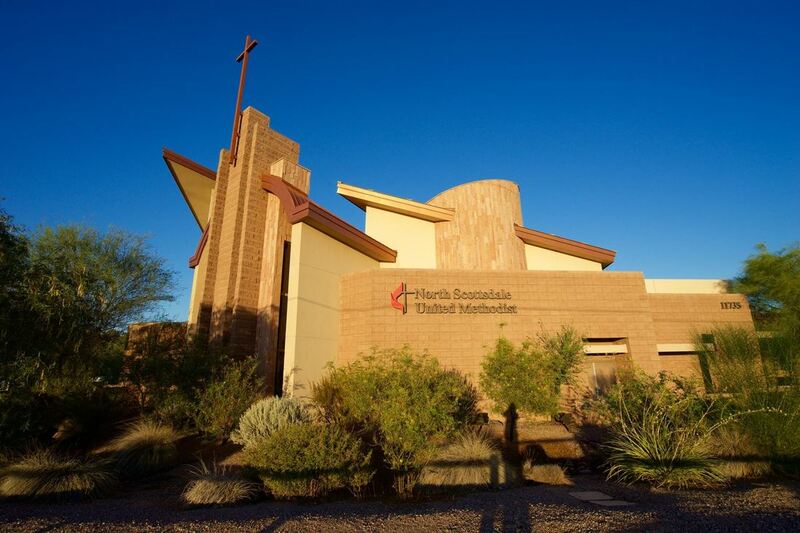 ​North Scottsdale United Methodist Church." The photograph on the left is from our sanctuary Mortgage Burning Celebration in January of 2018. The photograph on the right is of our congregation prior to the ground-breaking of the new sanctuary (2005). 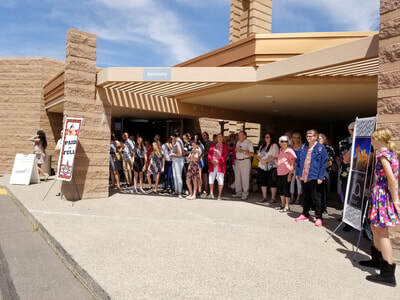 The congregation is standing in the dirt lot that has become our current 600 seat sanctuary. The Dedication of the new sanctuary was held in March of 2006. 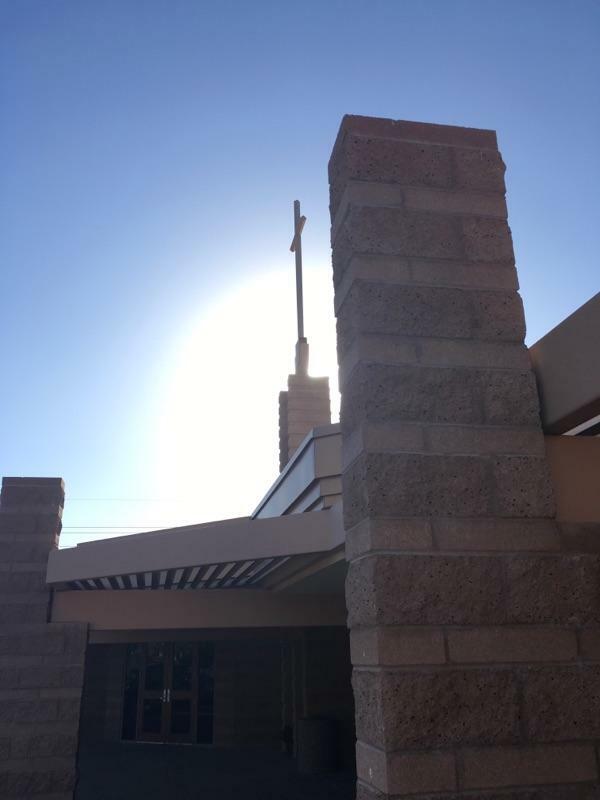 As the Arizona sunset streamed through glass panes onto the stacked stone prayer wall, the senior pastor stood on the adjacent sandstone chancel area and welcomed the congregation on an unusually brisk Sunday evening. The evening continued in the sanctuary with the adult choir leading the attendees in singing hymns of gratitude. 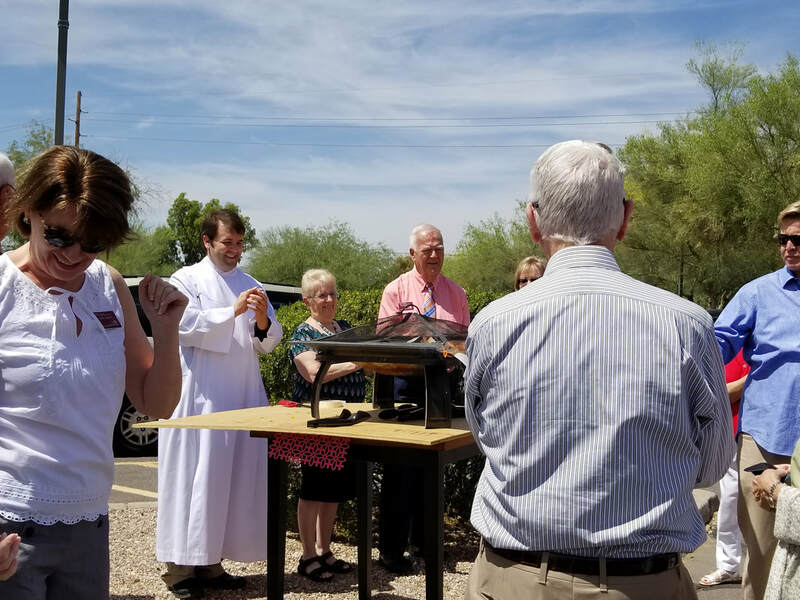 This inspirational celebration occurred on January 18, 2018 at North Scottsdale United Methodist Church (NSUMC). It was the 40th anniversary of their charter member’s vision. 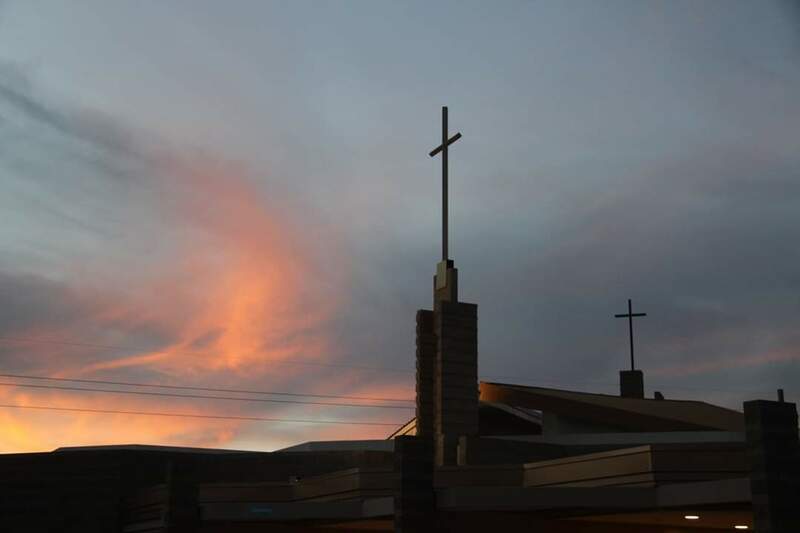 On that evening, the congregation celebrated four decades of service and ministry. 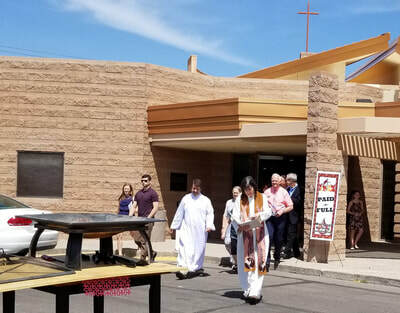 That celebration was led by their senior pastor, the Rev. Nancy Cushman. She highlighted the amazing humble pastors that propelled NSUMC to this moment. Many of the previous pastors (both senior and associate) honored the congregation with their attendance on that night. The Rev. 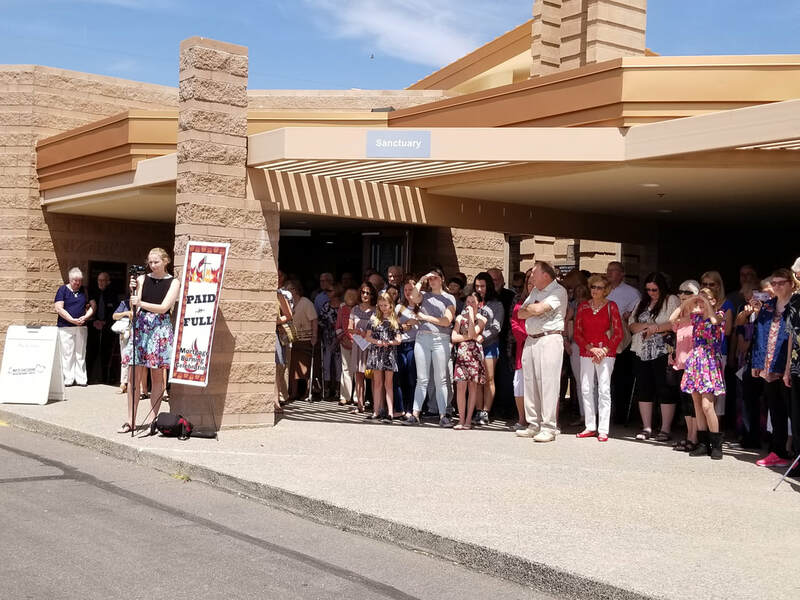 Susan Brims, district superintendent, graciously attended to help honor their rich history. During the presentation the Rev. Cushman also spoke about the many ways that NSUMC has extended the love of Christ to its members, in their ministries and through their mission work. The special evening continued with a video of NSUMC’s history and a hosted dinner for over 200 people. North Scottsdale UMC members at the mortgage burning. 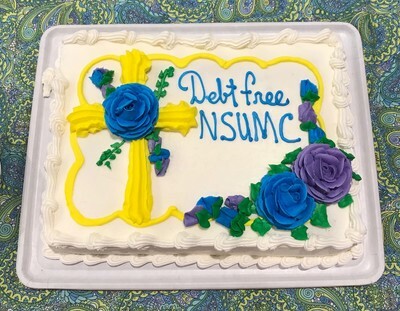 A short three months later, NSUMC enjoyed another amazing celebration. 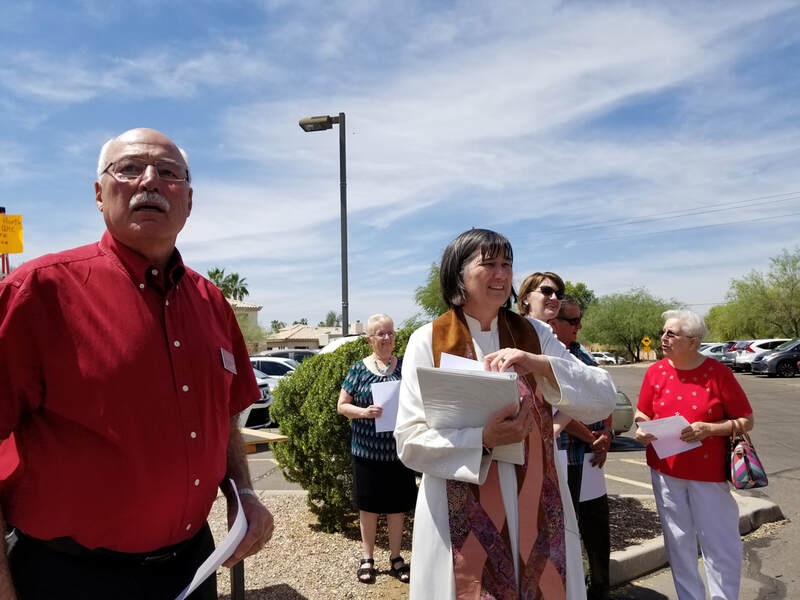 This time it was “Freedom at 40!” During their 40th year of charter membership within the Desert Southwest Conference of The United Methodist Churc, NSUMC no longer has a mortgage. In 2003 then senior pastor, Rev. 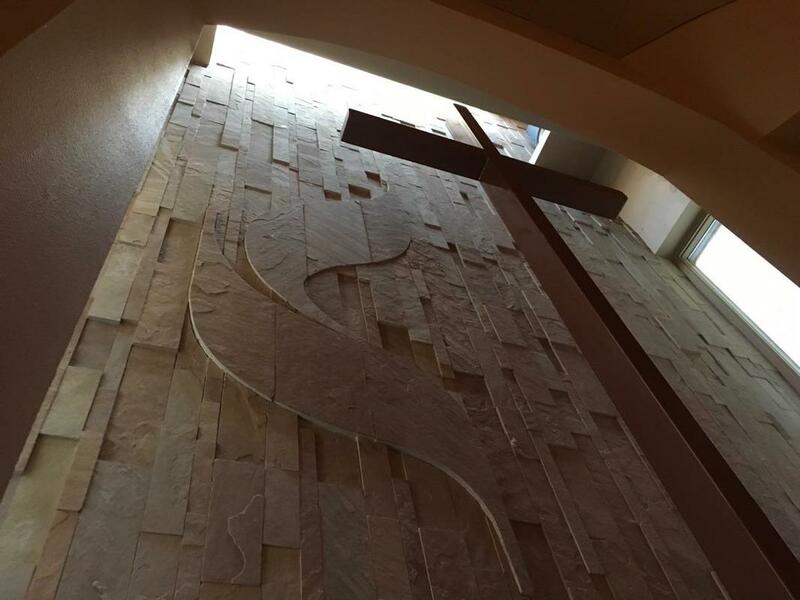 David McPherson had a vision to build a new sanctuary to accommodate the growing congregation. The Sanctuary Committee was born in 2004. 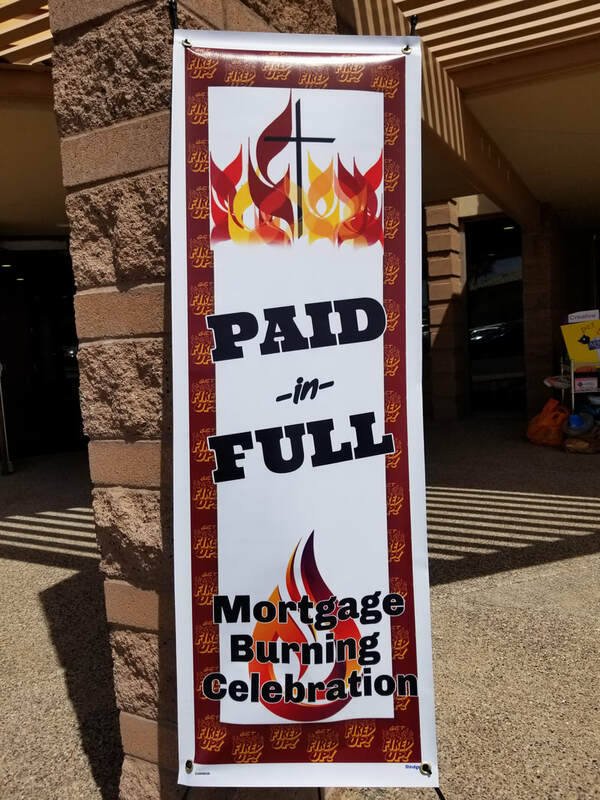 To celebrate their freedom from debit they hosted a Mortgage Burning Dedication following their 10:00 AM service on April 29, 2018. 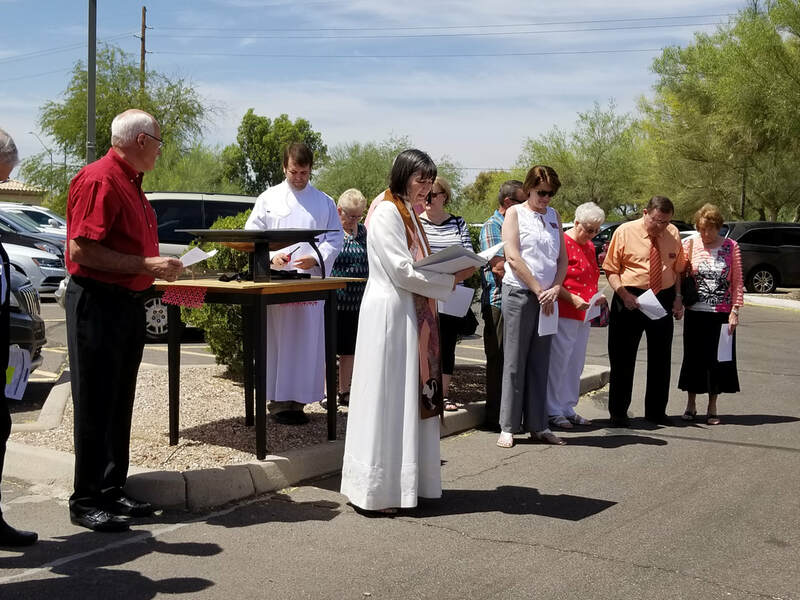 The entire congregation and guests traveled from the sanctuary to the front patio and joined current Senior Pastor, the Rev. 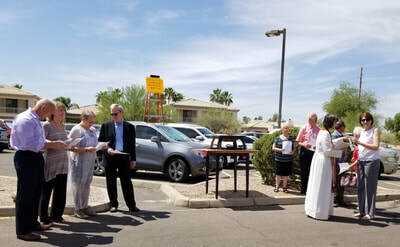 Nancy Cushman, outside as she symbolically burned the mortgage! NSUMC is grateful to their members for their 40-year history of extravagant generosity, dedication and tithing. They are also thankful for the blessings that this campus and its members have and will continue to offer its members, the greater community and people throughout the world. This is genuinely generous stewardship at its finest! “PAID in FULL” has a whole new meaning for NSUMC! 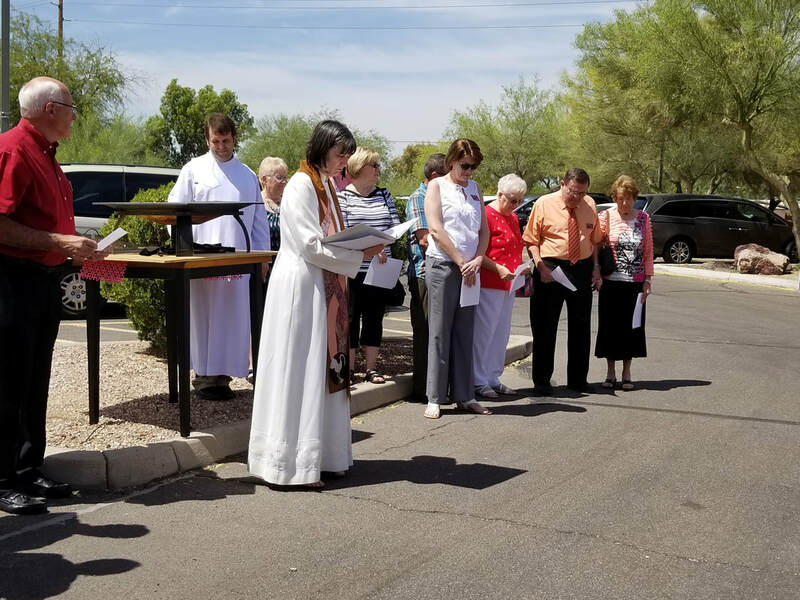 As they continue fulfill the vision of the Desert Southwest Conference to be a courageous church; loving like Jesus, acting for justice, united in hope. 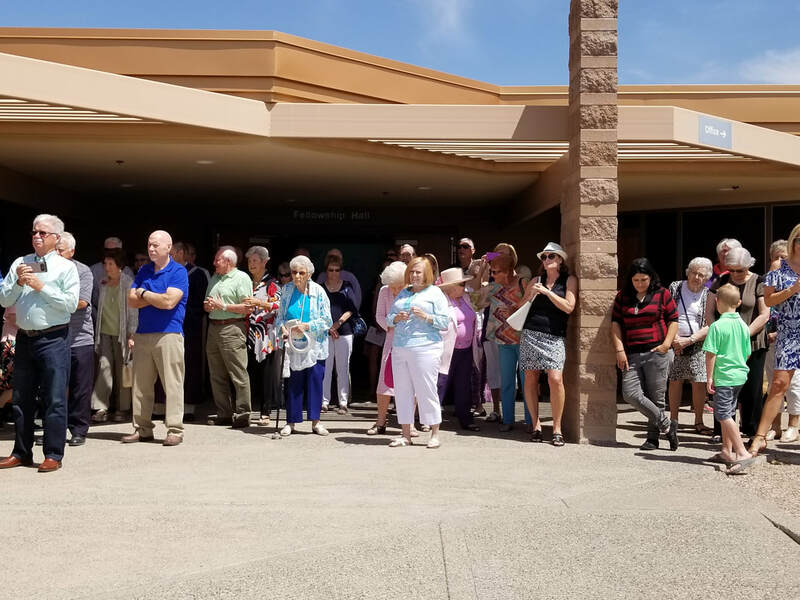 Sunday, April 29th, 2018--- 11:00 a.m.
North Scottsdale United Methodist church has "freedom at 40!" 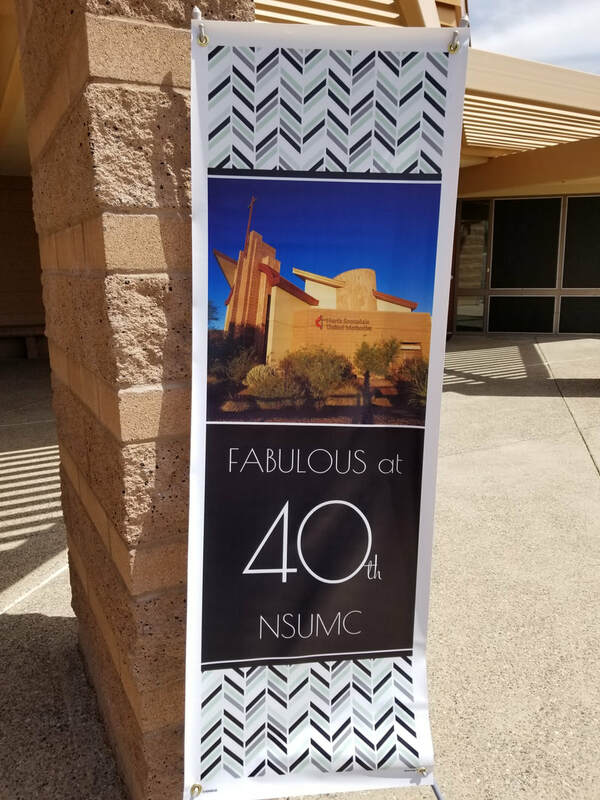 This is the 40th year of charter membership within the Desert Southwest Conference of the United Methodist denomination for N.S.U.M.C. 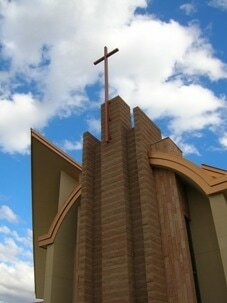 In 2003 N.S.U.M.C.’s Senior Pastor, the Reverend Dave McPherson had a vision to build a new sanctuary to accommodate the growing congregation. 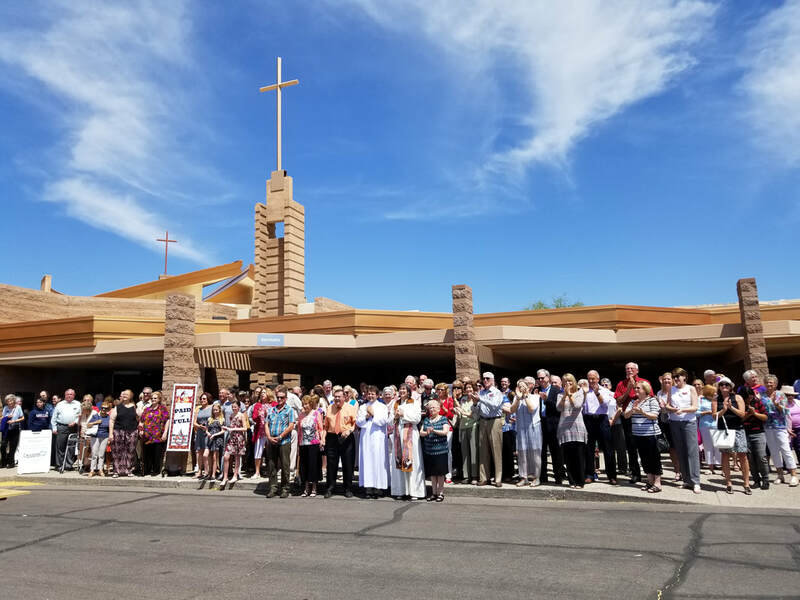 The Sanctuary Committee was born in 2004 and led by, current member, Art Endres. The committee hired architect firm Glasco-Bedrin and the Redden Construction Company was contracted to complete the build. The construction was finalized in January of 2006. 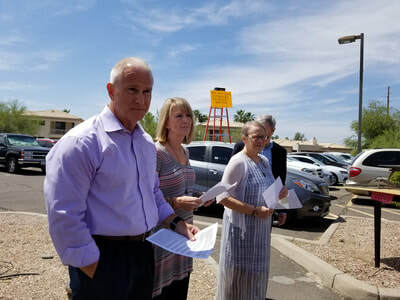 The total cost for the over 17,000 square foot addition was $3.7 million. 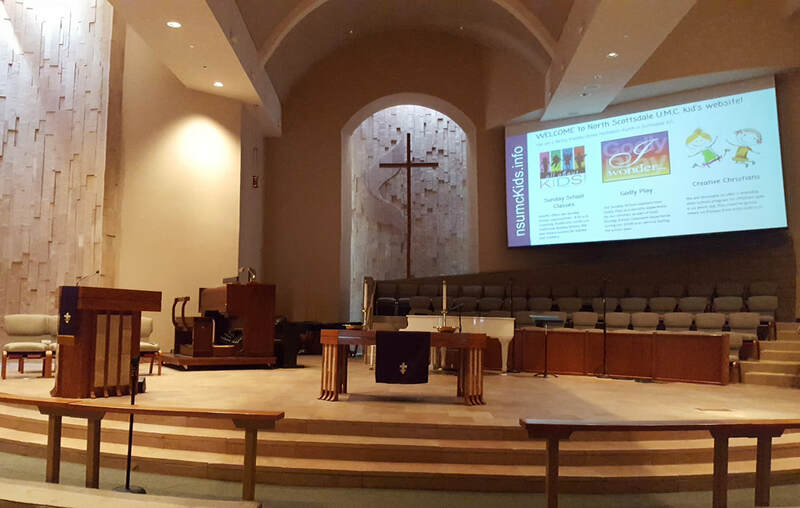 Over the past decade this 600 seat facility has hosted worship services, multi-faith celebrations, concerts, speaking engagements, theater performances, weddings, funerals, baptisms and summer day camps. The Dedication celebration began at the end of the 10:00 am service on April 29th. The entire congregation and guests were asked to exit the sanctuary and join current Senior Pastor the Reverend Nancy Cushman outside as they symbolically burned the mortgage! N.S.U.M.C. 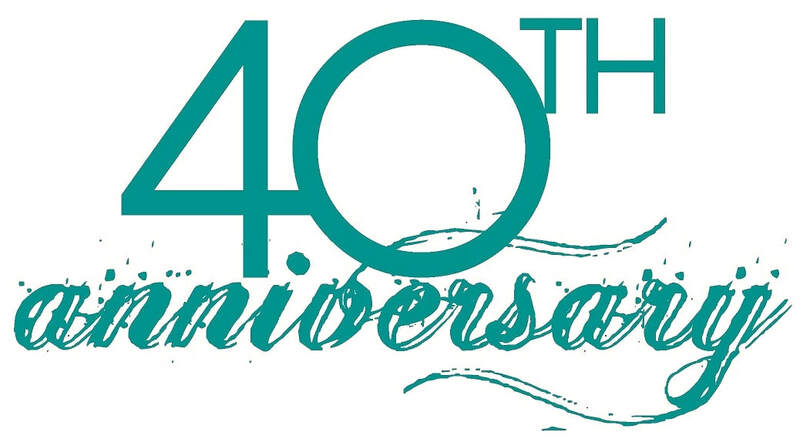 is grateful to its members for their 40 year history of dedication and tithing. They are also thankful for the blessings that this campus and its members have and will continue to offer its members, the greater community and people throughout the world. Generous stewardship at its finest! 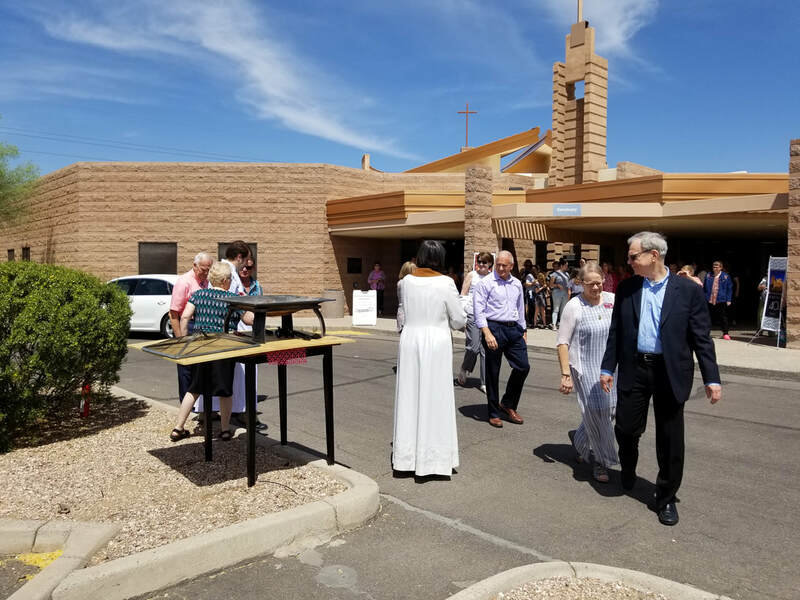 North Scottsdale United Methodist Church celebrates the love of God through Christ by having two services on Sunday (8:30 am and 10:00 am) plus Sunday school classes for children and youth. Other children and youth activities include; children’s choir, youth band, mission trips, small groups, festivals, carnivals and youth groups. N.S.U.M.C. also offers adult Bible studies, men and women’s groups, choirs, retreats, holiday events, turn-around trips, mission trips and more. If you are interested in additional information about N.S.U.M.C. 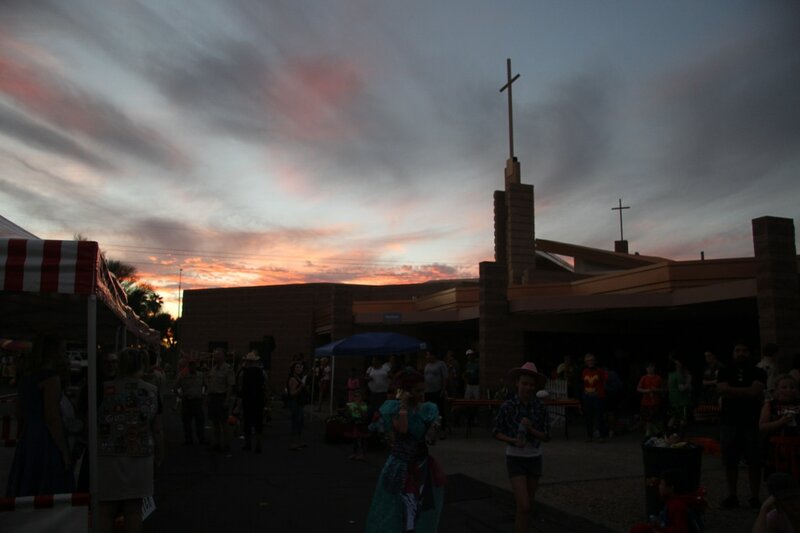 or any of these events, please call the church office at (480) 948-0529, check out their websites http://www.nsumc.com/ http://www.nsumckids.info/history-of-nsumc.html https://www.facebook.com/NorthScottsdaleUMC , https://www.pinterest.com/nscottsdaleumc or visit them at 11735 North Scottsdale Road (just south of Cactus Road). 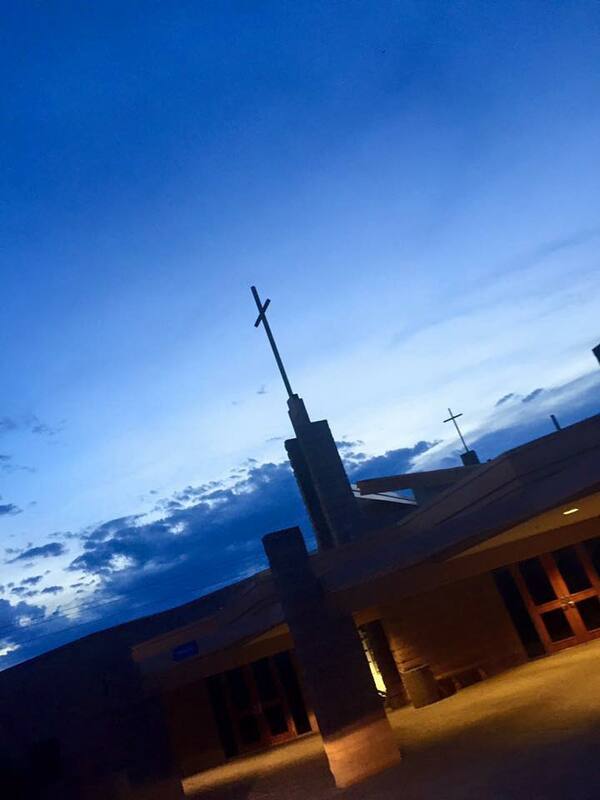 ​"Eternal God, let this building, which we dedicate to your name, be a house of salvation and grace where people gather. May we worship you in spirit and truth within these walls and beyond. May our community learn of you, experience you and may grow together in love because of you." ​What a fabulous celebration of 40 years of ministry in Scottsdale, Arizona and beyond! We love our faithful congregation! Our church family has been in ministry in North Scottsdale since January 29, 1978. 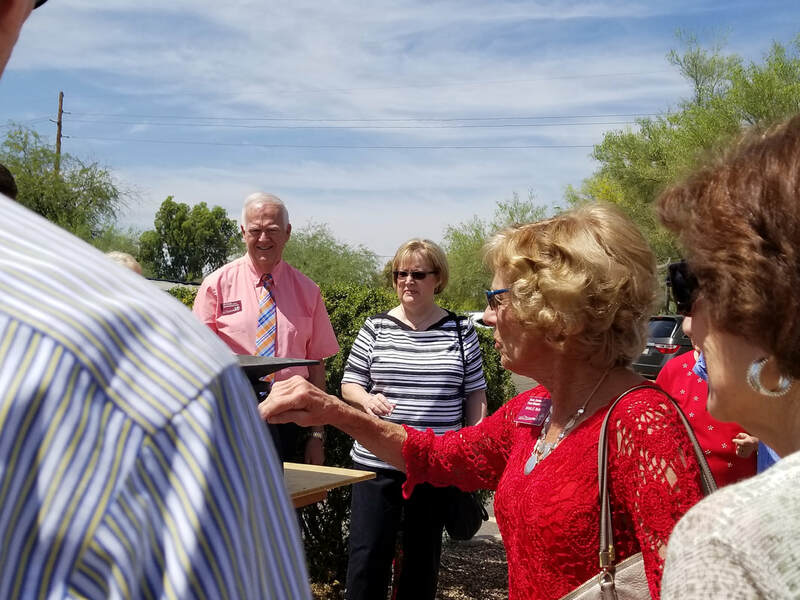 We are blessed to have had the opportunity to reflect the vitality and evolution of the north Scottsdale area. However, we continue to evaluate our ministry in an attempt to find more effective ways to share the eternal truth about our gracious God, whom we know through the life of Jesus. We are aware that we live in an ever-changing world, and it is an exciting journey to see where the Holy Spirit is leading us. If you are looking for a church family, we invite you to join us in this journey! Approximately 25 families who had previously attended Scottsdale U.M.C. 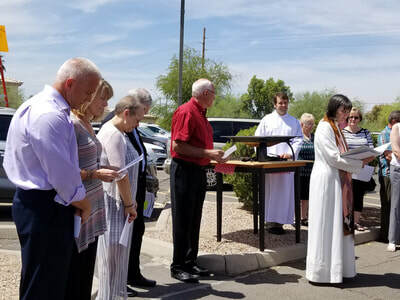 and Paradise Valley U.M.C., but who felt that another church in the neighborhood in which they lived was needed, started North Scottsdale United Methodist Church. The organizing pastor was Rev. Clifford G. Asay. 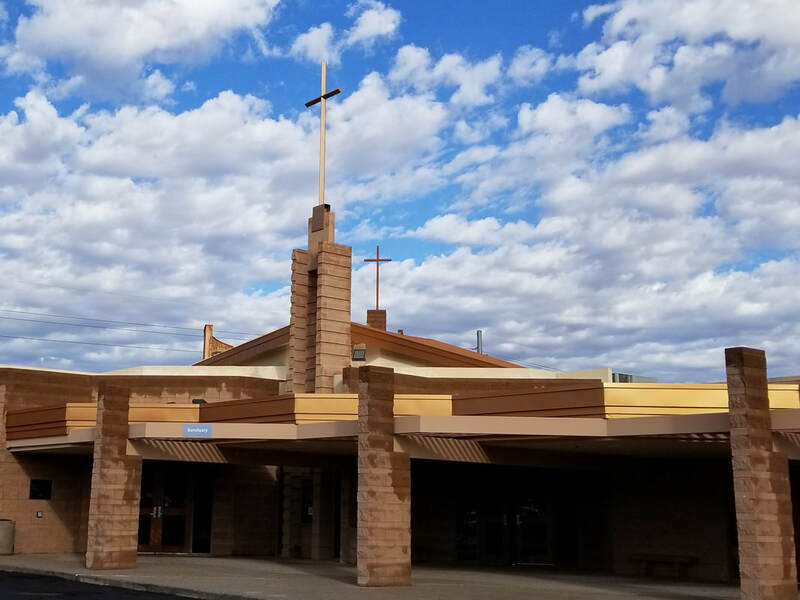 The first worship service was held at 9:00 a.m. on October 16, 1977 in the staff lunchroom of Chaparral High School with 99 people in attendance. 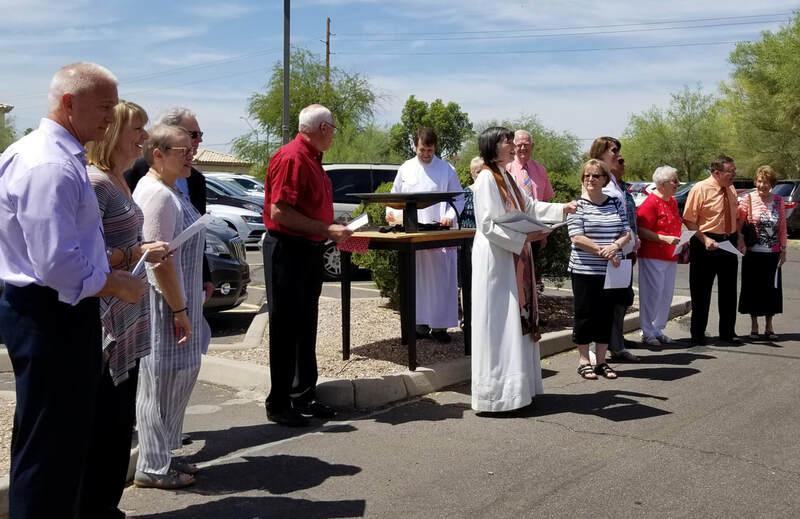 All of the Sunday morning services and meetings ended with the congregation joining hands and singing “Blest Be the Tie that Binds.". N.S.U.M.C. was officially organized on January 29, 1978. The church’s Charter holds 64 adult signatures and 16 “Preparatory Members” signatures. Eventually the United Methodist Desert Southwest Annual Conference helped the congregation purchase the land at Scottsdale and Jenan Roads, where the campus is currently. Rev. 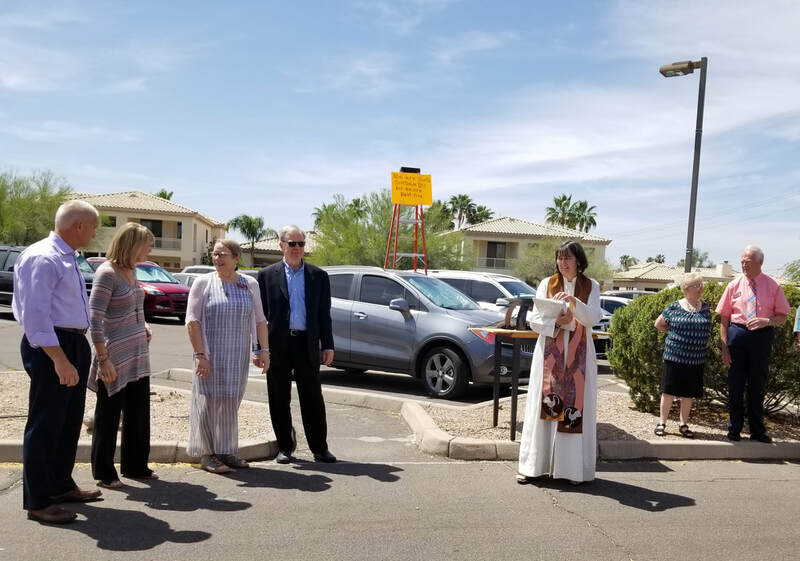 Asay conducted groundbreaking for the first building in the fall of 1982; the building was consecrated on October 16, 1983 by the new pastor, Rev. Harvey Kemp. Groundbreaking for the Education Wing was on February 9, 1986; the congregation’s new pastor, Dr. Ralph Gay, conducted a Dedication on September 28, 1986. 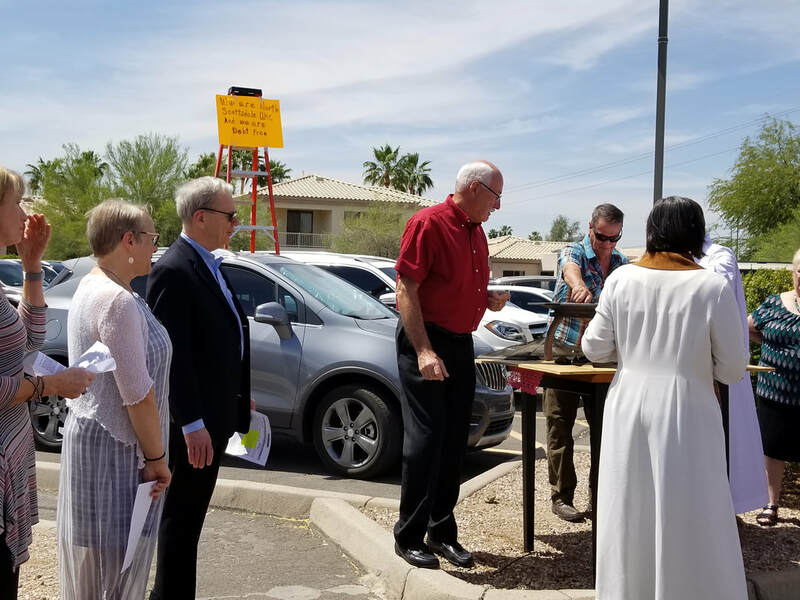 A new sanctuary was planned and groundbreaking was held for this addition on July 29, 1990; dedication was held in December, 1990, by Dr. Gay. Rev. Jim O’Neal conducted consecration Service for the new Office Wing, Youth Wing and East Wing classrooms on March 26, 1995. Some faces have changed over the years, but “the tie that binds” has been the love of everyone in the congregation who has helped North Scottsdale United Methodist Church to continue to reach out to the greater community. Our Education Ministry team had a dream. 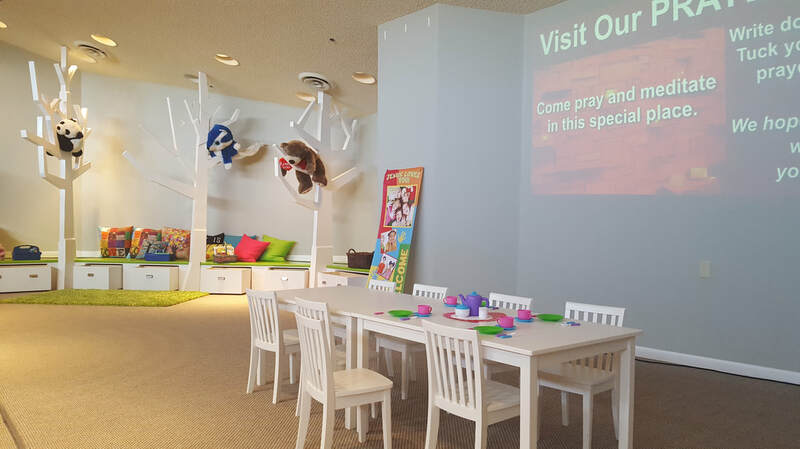 The dream included transforming the multipurpose fellowship hall into a kid friendly play zone. This transformation has allowed the children and their families to have fun activities following Sunday School and worship times. 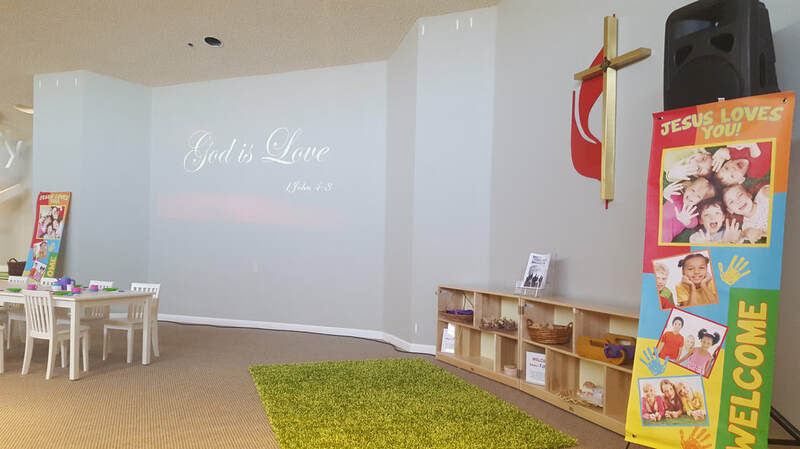 Families can congregate together to converse and allow their children to have fun playing with other Sunday School children in this great space. Some of the hands on activities include S.T.E.M. manipulatives (Science, Technology, Engineering and Math), Godly Play storytelling items, and books.